All things considered, Stilwell was rather relieved by the Generalissimo's refusal to cross the Salween River into Burma. Stilwell's memorandums to Soong had been eloquent in their description of Chinese unreadiness and, as Stilwell believed, unwillingness, so the months ahead could be used to good advantage. Up to the present, Stilwell had enjoyed a good measure of support from his government, and by January 1943 it was plain that he would need it if China were to be rearmed. True, the President at Currie's suggestion had refused to ask anything of the Chinese in return for lend-lease, but on the other hand, and apparently more important to Stilwell, the shrewd and well-informed Soong regarded Stilwell worthy of collaboration. So long as Soong, and such Chinese as thought like Soong, regarded Stilwell as commanding predominant influence in Washington, then Stilwell could apply himself to reform of the Chinese Army without worrying about his position. The Generalissimo's action could even be made to support the cause of Army reform, so long as Stilwell's superiors appeared to attach importance to his projects. Unity and coherence among American personalities and agencies would be vital in dealing with the Chinese. With unity and coherence, with American technical skill to draw on, the most daringly conceived projects might perhaps succeed despite all that could be urged against them, but "if the trumpet give an uncertain sound, who shall prepare himself to the battle?" Stilwell's initial and personal reaction to the Generalissimo's withdrawal from the projected March 1943 offensive was an indignant one, but, after he had surveyed the new situation and mapped out his course of action, he wrote in his diary on 18 January 1943 that it was a "damn good thing March 1 is off. We'd have been hung. "1 There must have been encouragement for him in a letter from Stimson that he received about this time, even though the Secretary of War wrote it before the Generalissimo's refusal to cross the Salween was known in Washington. Although I have not written you as often as I should have liked to, I have been following your negotiations and actions with the deepest interest and confidence. There is hardly a step you take that is not talked over by Marshall and myself and I know that our feelings for you are similar and deep. You have been sorely tried and I hope you realize how thoroughly we appreciate what you have been through. It is a very real source of gratification to us both that you seem now to be successful in conquering all of the difficulties which have been thrown in your path. Wherever it is possible, we have tried to smooth your way for we believe in the soundness of your judgment and the correctness of your strategic decisions. We realize the dangers and difficulties of the North Burma campaign which have apparently so disheartened Wavell and his staff, but we agree with you in thinking that it is a necessary prerequisite to any thoroughly satisfactory line of communications to China. We hope that you will be successful in conquering the difficulties of the terrain and the dangers of malaria. When I offered you this China mission I knew it would be a tough one but I confess I did not realize how very tough it would be; and I wish you to feel now my sympathy and congratulations for the surpassing fortitude, skill, and courage which you have shown in carrying through. I hope that the New Year will give you a full measure of success and the satisfaction that will go with it. At Ramgarh. a. Continue the combat training of the New 1st Army [22d and 38th divs.]. b. Augment the force by one division, c. Set up an armored force school, d. Set up a CWS school, e. Continue and amplify instruction in artillery, infantry weapons, motor transport, anti-aircraft, signal, engineer, medical, and QM branches. Organize six additional 75-mm. pack howitzer battalions. Continue officers' school. At the base at Ledo. Prepare the base, with medical, motor transport, engineer, and supply facilities. Stock it. Work on the road. In Yunnan. a. Concentrate, re-organize, equip, and train the units to participate. b. Build up stocks of supplies. c. Establish in the Kunming area officers' schools for infantry, artillery, and air-ground liaison. Feed instructors from these schools to the armies in Yunnan. d. Thoroughly organize the SOS and all its services--engineer, medical, signal, motor transport, depots, etc. e. Repair and develop the Burma Road, and prepare the communications to the east. The proposed agreement had three significant new points. On 6 January Soong had formally asked on behalf of the Chinese Government that the United States assist in the reorganization, training, and future planning of the Chinese Air Force, with "quite a few [U.S. airmen] in order to stiffen the whole force," and for operations under Chennault's control. Stilwell therefore included this major point. The draft also invited attention to the importance of developing a line of communications from the terminus of the Burma Road to east China and made the important proposal that designation and reorganization of the second Thirty Divisions begin at once.6 Obviously Stilwell felt the time had come to raise the major issue of a second Thirty Divisions. This is our opportunity to equip and train a force that will make China strong and safe. The opportunity must be seized while the supply of weapons is available. If the first 30-Division Plan is carried out and the force used offensively, I will have a basis for demanding the equipment for another thirty divisions. I have already recommended the procurement of this matériel, and if a plan is produced to equip and train them, I can ask for instructors to assist in their training. I recommend that the program for the Y-Force be pushed; that the concentration of the troops be expedited; that General Ch'en Ch'eng be relieved of all other duties at once; that any necessary changes in Armies for the Y-Force be made at once; that financial arrangements be authorized; and that the training program be approved. Also that the units of the second 30-Division Plan be designated; that their re-organization and re-equipping be started at an early date; and that a plan of training similar to that proposed for the first thirty divisions be adopted. If these things are done now, by next fall the first thirty divisions should be an efficient field force, and the second thirty divisions should be well advanced in tactical training. With a supply line open, both groups could be equipped promptly with their weapons, and from then on China would have nothing to fear from the Japanese. Without such a definite plan, there will be difficulty in continuing the present flow of supplies from the United States, let alone increasing it materially; as I am trying to do at present. Stilwell's force was thus about the size of an infantry division. Stilwell, Bissell, and Alexander stated that 5,000 tons a month meant 140 aircraft (C-47 [DC-3]) on the Hump during good weather and 300 during the monsoon; 280 crews during the monsoon, and 234 at other times, plus spares and gasoline. In October 1942 Stilwell asked the War Department to provide these aircraft in time to hit the 5,000-ton goal by February. His next communication from Marshall crossed this radio and was not in answer to it. Marshall's radio took the aircraft and men of the airline to China from Stilwell's command and placed the airline under the Air Transport Command. Henceforth, the airline to China was a semiautonomous organization within the CBI Theater, which theater headquarters had to support but which it could not command. Semiautonomous is an awkward word, but it seems to approach the realities of the situation more closely than to say ATC in CBI was actually independent of theater headquarters. Several factors made for this. Item, Stilwell was theater commander; if he expressed a wish, would ATC be politic to refuse? Item, ATC depended on Stilwell for its logistical support, and any wise commander stays on good terms with those from whom he draws his beans and bullets. Thus, when Stilwell learned that food and living conditions in one ATC mess were intolerable, he stepped in with direct orders to ATC to straighten up the place. ATC complied forthwith. Marshall explained that the step was taken because of accumulating evidence that the transports in India were not being used as well as were those of the ATC in other parts of the world. Marshall believed that diversion of aircraft from the Hump for intra-India transport might have a part in this. He reminded Stilwell of the heavy pressure from the White House to increase deliveries to China. When the Combined Chiefs of Staff agreed in August 1942 to lay Marshall's proposal for a Burma operation before their planners, in effect they placed Burma operations on their agenda. In retrospect, much of the difficulty which had attended the first attempt to plan a combined operation in Burma seems to be that the proposal to invade Burma in March 1943 was never an operation agreed on at the highest Allied levels. There was no CCS directive setting the scope and objectives of ANAKIM and binding Wavell and Stilwell to work in harmony. There was no JCS directive to Stilwell, who had to find support for his projects. As for the Chinese, they were outside the CCS machinery, and when the Generalissimo pledged himself to attack, he did so under circumstances of which he was the sole judge. The strategic picture in the Pacific war as of January 1943, and indeed for many long and weary months thereafter, lent a peculiar emphasis to the strategic advantages which might be won in China. Along the whole vast arc of the Pacific and the Bay of Bengal the outer defenses of the Japanese kept Allied sea and air power in those sectors far from Japan's vitals. The two campaigns then under way, in the Solomons and in New Guinea, were proceeding slowly and were unsettled. Losses on both sides had been heavy and the Japanese had resisted with great determination. A major Japanese naval concentration just north of the Solomons suggested the Japanese might be preparing a major effort to decide the struggle for Guadalcanal. sequence of the several courses of action, rather than over the desirability of attacking Japan from China. With this view the War Department heartily agreed, and therefore Stilwell was sent to "increase the combat efficiency of the Chinese Army." To attack Japan from China on an effective scale required a very considerable establishment in China. Aircraft require spare parts, fuel, and ammunition, and ultimately replacements. Pilots become casualties or earn replacement. The airfields from which they operate must be guarded against a ground reaction by the enemy. Therefore, the professional service element in the American leadership conceived of a major effort to open an effective line of communications into China at the end of which really considerable air power could be sustained. This major effort would be a great left hook to the Japanese jaw, which would then be softened up for the crushing straight right coming across the Pacific. He said that he is most anxious to open the Burma Road, not so much for the morale effect on China as for the need to provide air support to China for operations against Japan and Japanese shipping. He said the expensive operations in which we are now engaged in the South Pacific react on everything else the United Nations attempt to do whether it be in the Mediterranean, the United Kingdom, or elsewhere. He discussed the situation in the Pacific as being so critical as to make it appear at one time that Operation TORCH [occupation of French North Africa] would have to be called off. He also stated that unless Operation ANAKIM could be undertaken, he felt that a situation might arise in the Pacific at any time that would necessitate the United States regretfully withdrawing from the commitments in the European theatre. 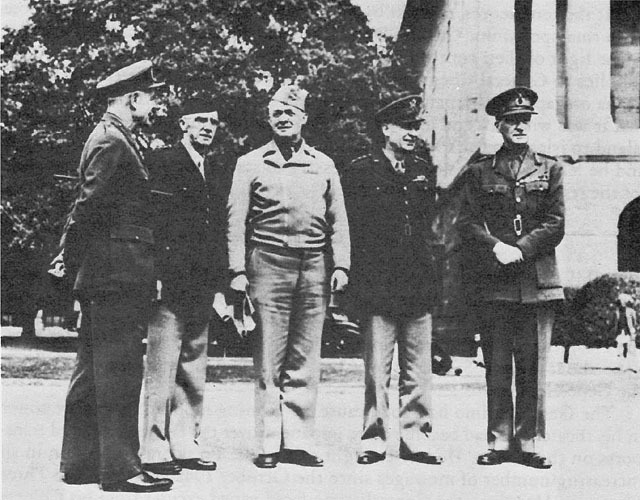 Arnold, Somervell, and Dill with their staffs flew to New Delhi to confer there with representatives of Wavell's and Stilwell's staffs. Arnold had with him good news for China Theater: by 1 April 137 transports would be present in the CBI Theater, of which 124 aircraft were for the Hump, and the 308th Bomb Group (B-24) was coming to India.30 The purpose of the gathering was to prepare a detailed proposal for Burma operations based on the Casablanca decisions. The proposal could then be submitted to the Generalissimo. Since the actual decision to invade would be made later by higher authority, the conferees had no power to bind their governments and kept the record straight by reaching a decision without commitments. CONFERENCE AT NEW DELHI, INDIA. Left to right, Field Marshal Sir Archibald P. Wavell, Lt. Gens. Stilwell, Henry H. Arnold, Brehon B. Somervell, and Field Marshal Sir John Dill. The Generalissimo had good cause for wanting more American air power in his theater. He had become quite impatient over the lack of promised transports on the Hump. He had brought this to the President's attention in an increasing number of messages since the October 1942 answer to the Three Demands. Moreover, the Generalissimo faced varied excuses from his Chinese Air Force for not conducting their portion of the China Air War Plan.35 During the past six months, thanks to weather, the Chinese Air Force was relieved of the responsibility of defending Chungking. But during the same period neglect and incompetence had ruined the bulk of its lend-lease aircraft. The Chinese Air Force had failed in its training program and failed to carry out the Generalissimo's paper reforms. Chennault reported that the Chinese Air Force objected to operational control by a foreigner and flatly rejected advice to prepare for the day when the Japanese would return over Chungking with the fine spring weather. The Generalissimo finally approved the ANAKIM operation on 6 February, and a banquet followed to mark the event. After dinner the Chinese again raised the question of immediately increasing the amount of tonnage being flown into China, and Arnold was again called on to explain and defend the ATC's performance. The next day Arnold was summoned for a private audience with the Generalissimo. The Chinese leader told him bluntly that the conferences had been a failure. The Generalissimo had asked for many things, and all he had received were excuses. Then the Chinese presented to Arnold for approval by the President an enlarged version of the Three Demands of June 1942, accompanied by hints of a separate peace. The Generalissimo now demanded: (a) an independent air force for China Theater, (b) ten thousand tons a month over the Hump, (c) five hundred aircraft in China by November 1943.
he was trying to increase the tonnage delivered to China, had given the necessary orders, but could not promise 10,000 tons by a fixed date because too many factors not under Arnold's control were involved. Tactfully, Arnold thus sought to persuade the Generalissimo that measures to satisfy his demands were under way and firmly told the Chinese leader that the principal question was whether or not China would join in efforts to retake Burma. From Chungking the discussions moved to Calcutta on 9 February "to ensure that the decisions reached at Casablanca and Chungking should be perfectly clear to all concerned. "40 Present for China were Soong and Ho; for the United States, Arnold, Somervell, Bissell, and Stilwell; for the British Commonwealth, Dill and Wavell. Invited to describe China's share in the offensive, Ho said that with a grand total of over 100,000 men the Chinese would make three main thrusts toward Myitkyina and Bhamo with seven divisions, and two subsidiary thrusts toward Lashio and Kengtung. If all went well, these would join with Stilwell's Ledo force, and the two subsidiary thrusts would head for Mandalay. Though Ho did not want to set a definite date for this offensive, he promised China would be ready to attack when the monsoon was over. The Chinese agreed with Stilwell that by late October 1943 the Yunnan roads would be dry enough. Wavell said he would advance from the Chindwin with three divisions (45,000 men) to join the Chinese at Mandalay, plus one division in close support, another in the Arakan, and five divisions in general reserve. The conference attempted to assay the potential Japanese opposition, which Wavell set at eight divisions, and Ho at ten. The discussion of Japanese air strength produced a varied reaction with Wavell suggesting 350 Japanese aircraft possible; the Chinese, 750. From talk of Japanese air strength the discussion turned to the Generalissimo's demand for 10,000 tons a month over the Hump by fall. Stilwell observed this would require additional facilities at both ends of the line. The Chinese, he said, could construct theirs; would the British be able to match them? It would involve not just additional airfields, but increased road, rail, and river capacity. Then the Generalissimo's 7 February letter arrived in Washington with its requests, accompanied by a letter from Stilwell expounding again his quid pro quo or bargaining thesis. As he sent Stilwell's letter on to the President, Marshall might have recalled that a few weeks before he, Marshall, had approved Stilwell's telling the Chinese that the United States would resent the Generalissimo's failure to cross the Salween in spring 1943, that China must show signs of seriously intending to pull her weight in the struggle. Arnold's and Somervell's trip has been very helpful. I am particularly pleased that Arnold had a look at the machinery of Chinese government and a glimpse of the personalities we have to deal with. We are grateful for your assistance [the B-24's and transports], even if the Chinese are not. Chiang Kai-shek has been very irritable and hard to handle, upping his demands no matter what is given him, and this attitude will continue until he is talked to in sterner tones. For everything we do for him we should exact a commitment from him. The issue (Marshall and Stilwell versus the Generalissimo and Chennault) was now before the President for action. His decision was to back the Generalissimo and Chennault. The President directed preparation of a radio to the Generalissimo stating that Chennault would be placed in command of his own air force, the Fourteenth; that this air force would be built up to 500 aircraft as rapidly as Chennault believed he could support them in China; that as facilities improved, the ATC would be built up until 10,000 tons a month were being flown into China. At this point the President acknowledged the views of his service advisers by telling the Chinese that the ATC could never bring in enough, that a road would have to be built. Nor did he accept the Generalissimo's request for a renovated Chinese Air Force supported by 5,000 tons a month. He did suggest Arnold's more cautious plan to rebuild the Chinese Air Force one squadron at a time as pilots and aircraft were available. Marshall on 19 February gave Stilwell advance notice of the radio to the Generalissimo. To Marshall, Roosevelt explained his dismissal of the War Department's approach to the strategic problems of China Theater. In his explanation the President explicitly rejected the bargaining or quid pro quo technique of working with the Chinese, displayed a lack of interest in Stilwell's mission of reforming the Chinese Army, and referred to Stilwell's projects as nothing more than local preparations for a Burma campaign. The letter closed with the good-natured reminder that he had overruled the military before and now thought he had been right in doing so. Thank you for letting me see the copy of Stilwell's letter of February ninth in regard to Arnold's and Somervell's trip. I have read this letter with a good deal of care and my first thought is that Stilwell has exactly the wrong approach in dealing with Generalissimo Chiang who, after all, cannot be expected, as a Chinese, to use the same methods that we do. When Stilwell speaks about the fact that the Generalissimo is very irritable and hard to handle, upping his demands, etc., he is, of course, correct; but when he speaks of talking to him in sterner tones, he goes about it just the wrong way. All of us must remember that the Generalissimo came up the hard way to become the undisputed leader of four hundred million people--an enormously difficult job to attain any kind of unity from a diverse group of all kinds of leaders--military men, educators, scientists, public health people, engineers, all of them struggling for power and mastery, local or national, and to create in a very short time throughout China what it took us a couple of centuries to attain. Besides that the Generalissimo finds it necessary to maintain his position of supremacy. You and I would do the same thing under the circumstances. He is the Chief Executive as well as the Commander-in-Chief, and one cannot speak sternly to a man like that or exact commitments from him the way we might do from the Sultan of Morocco. The other matter relates to the complete omission by Stilwell of any mention of air action in China in 1943. He is thinking of the Burma end of things and he is thinking of the ground forces now being trained in China. While I am hopeful of the Burma operation, I still believe that important emphasis [should?] be placed on the strategic value of Chennault's air operations in 1943. I am glad to see it being pushed. I know you will see that the directives sent to Stilwell and Chennault are so clear about our air plans that there will be no misunderstanding of our intentions. It is essential that Chennault get his share of the supplies, and I believe he should get all above 4,000 tons a month until he gets an amount that will really keep his force operating. I understand from Arnold that is something over 2,500 tons a month on an all-out basis. The construction and improvement of airfields both in India and China should be pushed to the limit. I am assuming that the big bomber group now en route will be directly under Chennault's command. Of more importance is the assurance--the air policy having been fixed in China--that Chennault, with Stilwell's approval, will have complete control over his operations and tactics. While I am sure the relationship of Stilwell and the Generalissimo has improved, I hope nothing will be done to prevent Chennault from discussing air operations with the Chinese in an appropriate manner. Our relations with China are important and I wish you would impress on Stilwell and Chennault that they are our representatives over there in more senses than one. Compatible with their military duties, they may well turn out to be the best "Ambassadors" we have in China. I hope they will. Above all, I am depending on you to see that Chennault gets his chance to do what he believes he can do. I do not think that the Staff plans either in Casablanca or here have given sufficient weight to the attrition against Japan each week and each month, or that that attrition can be greatly accelerated through increasing air power in China, by the sinking of Japanese ships off the coast of China, the destruction of Japanese aircraft, and the occasional bombing of Japanese cities. In answering the President, Marshall raised the principal War Department objection to the timing of Chennault's proposals. It was the argument with which the War Department always replied to Chennault and his adherents. Marshall warned that as soon as Chennault's effort stung the Japanese they would retaliate by attacking Chennault's airfields with their Army. Such an attack would have to be met by the Chinese Army, still untrained and without lend-lease arms. He also warned the President that many influential Chinese wanted the United States to fight China's battles for her. I have given a careful reading to your private memorandum of March 8th regarding the relations between the Generalissimo and Stilwell. I should like your permission to quote to him [Stilwell] the second and third paragraphs of your memorandum, omitting the direct reference to the Sultan of Morocco (memorandum is attached). As to the air phase of the matter, Stilwell is cognizant of our planned air effort out of China which will take place immediately upon the establishment of bases. I will further impress upon him to assist Chennault to the maximum, giving Chennault wide latitude in his operations. In this connection, the planes of the heavy bombardment group have already arrived in India; the ground crews will be there in about three weeks. The supply problem, affecting air operations from China in 1943, is a tremendous one. Chennault requires help in his logistical planning. To this end, we are sending General Glenn this weekend to be Chennault's Chief of Staff, with General Haddon as his Service Commander, together with a selected staff. must be met by men on the ground. Our "bomb Tokyo" bases in Chekiang Province have been destroyed as a result of Japanese ground action. These fields have not been repaired. The present Japanese advance into north Burma, although not yet in strength, probably has for its purpose the capture of the air warning stations protecting our Assam Air Freight Terminal. One station has already been forced to retire. Stilwell has just ordered a second Chinese regiment from Ramgarh to oppose this Jap move. The size of an air force that can operate from China is limited by the means that can be made available to Stilwell from the U.S. On the other hand, ground protection for our airdromes in China and the terminals of the air transport route must come from the Chinese Army. General Stilwell, realizing this, has concentrated on his local problem of creating dependable units in the Chinese Army. His approach to this problem has been fundamentally sound; namely, to assemble into a field force selected units, officered by selected leaders; this force to be equipped with U.S. equipment and trained sufficiently to place dependence on them in combat. Stilwell has had marked success in assembling a few units (Ramgarh Project) with selected leaders. However, he has met with considerable obstruction and delay in concentrating a larger force in Yunnan. Although recent reports indicate progress is being made, it will be an up-hill fight all the way. It is firmly established that Ho Ying-chin embodies a school of thought now existing in the Chinese Army, that a military "watch and wait" policy should be followed. This is manifested by constantly emphasizing a U.S. air effort against the Japs from China as a substitute for creating and training the necessary Chinese ground forces to make such air effort effective by opening a ground route of communications through Burma. The comparatively small air effort possible from China in 1943, although of great strategic value, can be only a beginning. With a land supply route through Burma and dependable forces to secure our air bases in China, we can increase our air action against the Japs and really hurt them. This means Burma must be recaptured. The part contemplated for the Chinese forces in this offensive is extremely important and the time remaining for their preparation is all too short. Accordingly, delay in organization and concentration for training is a serious obstacle to overcome. At every turn General Stilwell has been faced with the "let the other fellow do it" attitude on the part of the Chinese leaders. This attitude, combined with the present low combat worth of the Chinese Army, must be reversed before we can fully realize the Chinese potential in this war. To correct this must be the primary objective of any representative dispatched to this theater to represent American interests. General Stilwell has no doubt talked very plainly to the Generalissimo on many of these points in order to secure his assistance in creating conditions where our help would be effective against the Japanese. In doing this, there have been times when he has incurred the displeasure of the Generalissimo. This is unfortunate. However, I do not know of any other officer in our Army who combines Stilwell's knowledge of the Chinese and their language with his ability as a soldier and as an organizer. He is tough, but only such a man would have survived the Burma campaign, battered down British-Indian sluggish resistance to all our plans and made some headway with reorganization of the Chinese Forces. Conditions must be created in China and a land route established to make an all-out air effort continuous and effective. I am confident that the relationship between Stilwell and Chennault is such that Chennault will be given every opportunity to use his uncanny skill in the air against the Japs (see attached message). Chen Cheng is here and I am sticking to him to get a headquarters set-up established. He is our best bet and present indications are that he will go along with us. I hope to open Infantry and Artillery Training Centers here (Kunming) by end of month. Soong's remark about threat on several fronts is nonsense. Japs are foraging near Shasi [western Hupeh], elsewhere there is no activity. Generalissimo is entirely unconcerned about threats on any front. Chungking cannot or will not enforce its orders in this area [Yunnan]. Our presence threatens to affect the enormous smuggling racket here, and you may expect a campaign of vilification against me personally. I have already been accused of bad faith for keeping military supplies from racketeers. The continued publication of Chungking propaganda in the United States is an increasing handicap to my work. Utterly false impression has been created in United States public opinion. Army is generally in desperate condition, underfed, unpaid, untrained, neglected, and rotten with corruption. We can pull them out of this cesspool, but continued concessions have made the Generalissimo believe he has only to insist and we will yield. problems. Marshall and Stimson had approved it. Now the President announced that they had exactly the wrong approach. Without the President's support, Stilwell could not negotiate with the Generalissimo, and for about the next twelve months Stilwell was painfully aware that his position as Chief of Staff, China Theater, was largely formal. Henceforth, preparations in China proceeded in two separate and often conflicting areas. Chennault worked to increase his air force and fly more missions with it. Stilwell sought to reform the Chinese Army and prepare for a campaign in Burma. Preparations for a greater air effort and a campaign in Burma each required Hump tonnage, and there Stilwell and Chennault began to clash ever more strongly in March and April 1943. Their differences revolved around a fractional number, one fourth of the Hump tonnage entering China, for each desired five eighths of Hump tonnage in any one month for his project. (Chart 6) Clashes between the two men over command and policy continued. On 22 February Chennault presented a revised version of his plan to Stilwell, asking a little more in means and omitting the sweeping claims of the letter to Willkie. He stated that the Arnold-Somervell-Dill mission and Madame Chiang's appearance before Congress had probably warned the Japanese of forthcoming Allied offensive action, and that the Japanese were about to launch a major offensive to clear the Canton-Hong Kong line, drive the Chinese from the area between Nanchang and Changsha, and perhaps even go on to Wuchow and Kweilin, where lay some of the key east China airfields. an effective Air Force. It is assumed that the Chinese Ground Armies will offer resistance similar to that offered in previous years and that, given support of an effective air force, they will be able to block the Japanese advances in the directions indicated. "55 There was no suggestion that the Chinese Army needed lend-lease arms or training. Chennault then went on to say that given 150 fighters, 32 medium bombers, some more men, and 2,500 tons a month over the Hump (in February a total of 3,000 tons was flown in) he could not only protect the Hump air terminals but conduct consistent and effective operations in the central and coastal areas. In conclusion, he warned again that the Japanese were about to move and that early action was needed. Reinforcements for Chennault and added cargo capacity on the Hump to support his operations had been under way since March. The 308th Bombardment Group (B-24) landed in India on 18 March. The concept behind it was that the group would carry its own supplies from India to China until it had accumulated enough for an operational sortie on targets in China, and then begin a process of periodically accumulating and expending its stocks. In agreeing to this plan for the 308th Group, the President had been under the impression that one bomber on one passage from India to China could carry gas and ammunition enough for four sorties. Having discovered his error he then asked Marshall to put thirty more transports on the Hump to support the 308th, which had been assigned to CBI on the premise that it would be self-supporting. China. His files reveal no further attempts in the first six months of 1943 to place the matter before Chinese authority. The second problem lay in the fact that on the Indian side of the Hump the Assam airfields were not capable of supporting the aircraft now assigned to the ATC. To be sure, ATC efficiency still left much to be desired, but after December 1942 ATC was independent of Stilwell. The allocation of SOS and Indian resources had not taken into account the possibility of a greatly enlarged Hump effort; the President was ordering the assignment of transports to airfields not yet completed. When Stilwell in January 1943 told Wheeler to think in terms of an expanded SOS, Wheeler in turn discussed his projects and problems with Somervell during the latter's visit to India with the Arnold-Somervell-Dill mission. These discussions were significant. Stilwell's Mission in CBI centered about the reform of the Chinese Army. Problems of supply he left to the experts in logistics: Wheeler, who was of course Stilwell's supply adviser, and Somervell, who played the same role for Marshall. Their recommendations would determine the attitude their superiors took on supply problems. In Stilwell's case, he was happy to leave supply and engineering problems to Wheeler and to concentrate on his efforts to persuade the Generalissimo to reform the Chinese Army. Stilwell's personal papers rarely mention the Ledo Road, and such casual references to the project as do appear indicate no great interest. On the other hand, references to the problems he met in attempting to reform the Chinese Army are extremely numerous, lengthy, and detailed. Preparation for ANAKIM in China continued at a fair pace in February-March 1943. Soong's departure for Washington and his work there on behalf of Chennault did not seem to interfere with Stilwell's progress in China. It was one of those rare and halcyon periods in wartime Sino-American relations when the Chinese were co-operative and reform of the Chinese Army was in progress. It may be surmised that, pending clarification of the American attitude, the Generalissimo co-operated with both Chennault and Stilwell. Training. Training is to be carried out in training centers and in the units themselves. Officers are to attend courses of about six weeks each at the training centers of the Kunming area. After graduating, they go back to their units and become instructors in the unit schools. The unit schools are to be organized and conducted by American instructors permanently stationed with armies and divisions. This will ensure that training is continuous, progressive, and uniform. A group of American instructors will be placed with each army, and can organize the unit schools in the divisions belonging to the army, supervise instruction, and keep the army commander informed of progress. Preliminary orders for the Artillery Training Center went out on 19 January. Chen's appointment as Commanding General, Chinese Expeditionary Force, was finally and formally announced on 17 February, after a period in which General Ho attempted to persuade the Generalissimo to reconsider. The Infantry and Artillery Training Centers opened their doors on 1 April 1943.82 In the case of the Artillery Center at Kan-hai-tze, of which a detailed account is extant, the doors opened after a brisk struggle with local Chinese authority and Chinese workmen that illustrated some of the difficulties in the way of giving aid to China. The school had all the outward aspects of a school. It had adequate buildings. It had ample training areas. It had a rifle and machine gun range. There was a Commandant, Assistant Commandant and faculty. An elaborate training schedule was on hand. There was an opening exercise and a graduating exercise and ceremonies each Sunday morning. The sad thing was that it did not teach. No one fired on the ranges. No one maneuvered on the training areas. Haphazard lectures or, to be more accurate, speeches were the order of the day. When the school was inspected by visitors there was a series of "set pieces" which were put on to convey the idea of scheduled and progressive training. By mid-March 1943 the Generalissimo's failure to create a sound command structure for Y-Force and to concentrate its divisions was the major missing portion of the Soong-Chen-Stilwell program of 28 January.95 On 7 March Stilwell reported these issues to Marshall. He explained that malnutrition, sickness, corruption, and lack of equipment made the troops in Yunnan a "terrible indictment of China's leaders. "96 Of the eleven armies on hand or expected, five were good by Chinese standards, three were fair, and three were worthless. 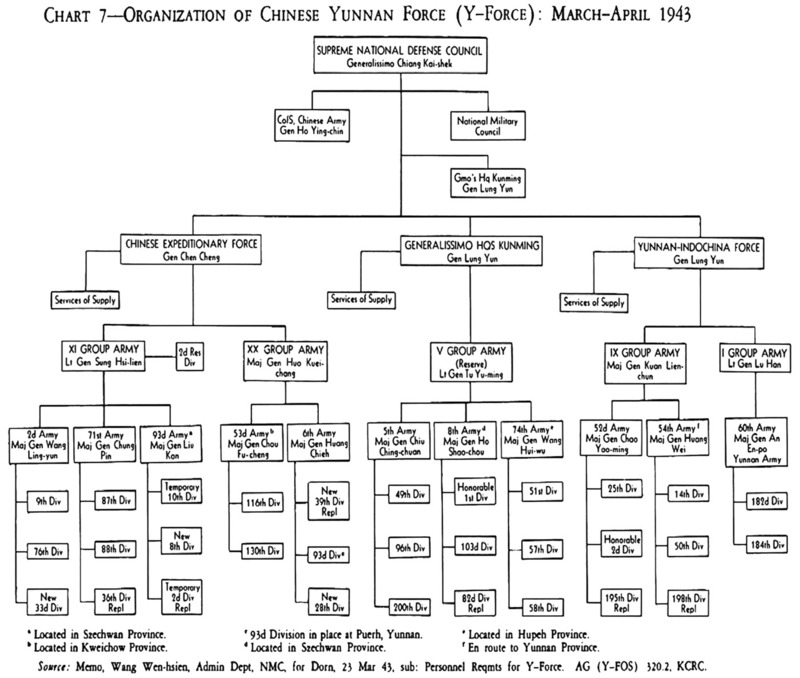 The war lord situation in Yunnan seriously hindered the logical evolution of an over-all command structure for Y-Force. (Chart 7) Neither the Indochina border armies, with their important holding mission, nor the Y-Force strategic reserves around Kunming were under General Chen's command. Instead, his Chinese Expeditionary Force faced the Burma border without any control over what happened in its rear. The only semblance of unity was Chen's influence over the Y-Force training program. Eleven Armies (corps) [in terms of U.S. Army strength] containing thirty-one (31) divisions are assigned to Y-Force. The 2d Reserve Division will remain an independent division. Thus the above Armies will consist of two "assault" divisions and one replacement division each. and was attached to organic divisions at the order of the Army commander. When it was possible to bring some 75-mm. 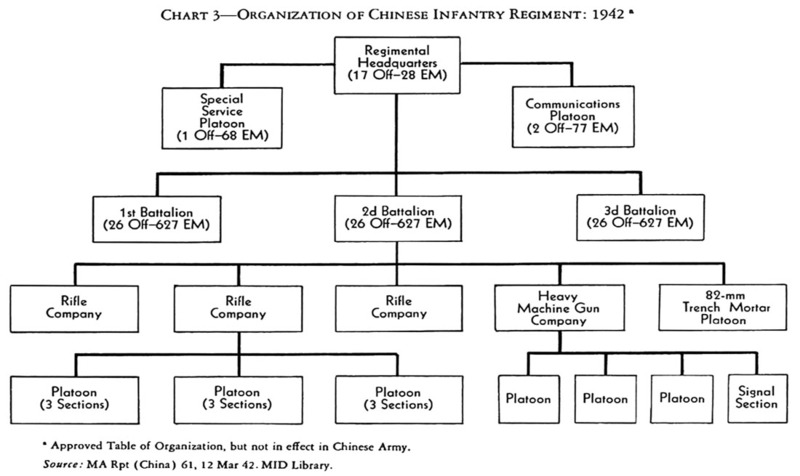 pieces into China, Stilwell recommended personnel changes in the artillery units of the Army command]. The two divisions of the 60th Army (Yunnan Provincial troops) will be brought up to the present Table of Organization strength (1942) of 7,800 each. [Army troops numbered 4,200 men]. Y-Force was understrength by 185,255 men. Nevertheless, the Chinese War Ministry's plan to provide 122,753 replacements by 10 June met with Stilwell's approval. (Table 6) Why were divisions so far understrength in a country Westerners always thought of as teeming with men? There were two reasons: First, in a peasant, small-holding economy only so many farmers can be removed from the land without causing famine. By 1943 Chinese manpower reserves were badly depleted, hence Stilwell's proposals to fill up the better-trained divisions by taking men from the poorer. Secondly, the Chinese supply and impressment systems were very bad. The central government gave cash allowances to unit commanders with which to buy rice. Source: Memo, Wang Wen-hsien. Admin Dept, NMC, for Dorn, 23 Mar 43, sub: Personnel Reqmts for Y-Force. AG (Y-FOS) 320.2, KCRC. Burma. The basic principle behind the new tables was that all Y-Force units down to the smallest should be able to operate as self-contained combat teams. (See Chart 3.) The Salween Front was over 100 air miles long, the 56th Division would be spread very thin, and the Chinese could simply flow through the inevitable gaps. weapon quite capable of dealing with the thinly-armored Japanese tanks. Artillery for the Y-Force would be equal, weighed by number of weapons, to nineteen battalions, mostly with pieces of 75-mm. This force was far more than the Japanese defenders would have. In mid-April Stilwell was confident China would find them. He was partially satisfied with the progress being made in Y-Force. The Artillery and Infantry Training Centers for brushing Y-Force officers into shape were in operation. General Chen Cheng was co-operative beyond Stilwell's highest previous hopes. Concentration of divisions in Yunnan was proceeding. Then on 18 April 1943 Stilwell met with the Generalissimo, who "acted scared. Morale at low ebb. "102 Japanese activity in central China, on the direct path to Chungking, was increasing. The result of this activity was irresistible pressure to drain men and supplies from Yunnan to the I-chang gorge area of the Yangtze, and much of the January-March progress with Y-Force was lost. In summing up the Calcutta discussions of February with the Arnold-Somervell-Dill mission, Wavell said that it was agreed to prepare for the fall offensive with all possible speed. His preparations were greatly influenced by the failure of his December attempt to seize the Akyab airfields.105 Wavell had wanted to make a quick amphibious seizure of Akyab to forestall Japanese reaction, but landing craft were not available, and so he had settled on an overland advance. The scheme was not hopeless, for Wavell's staff correctly estimated that but two Japanese battalions held the area. Speed in taking it before the Japanese could react was essential. Operations were under Eastern Army, Lt. Gen. N. M. S. Irwin. The Japanese fell back before the advancing 14th Indian Division, and on 27 December a patrol actually reached the southern tip of the Mayu peninsula directly opposite Akyab. Then, an unfortunate delay of ten days for administrative reasons halted the advance. The pause was fatal, for when the division was set to advance again, elements of the Japanese 55th Division had dug in and were defending themselves with the accustomed stubborn valor of the Japanese. Terrain that might have been taken by marching had to be conquered. The effort went on for months, with Indian and British brigades being fed into the Arakan district in sequence. Casualties were the only immediate result. The Indian and British soldiers could not know it, but their sacrificial courage once caused the chief of staff of the 55th Division to urge abandoning the Japanese foothold on the Mayu Peninsula to safeguard the landing of the main body of the 55th Division on Akyab. He was overruled, and the Japanese company garrisoning the key point clung to its defenses. Well to the north of the Arakan, in central Burma, the celebrated British soldier, Brigadier Orde Charles Wingate, led an experimental foray into Burma from February to June, 1943. Wingate had been sent to Burma at Wavell's request during the First Burma Campaign. His varied career had taken him to Palestine and Ethiopia, where he had acquired a profound knowledge of guerrilla warfare and an ability to apply the principles of war to novel situations. His arrival in Burma had been too late to affect the first campaign, but he did perceive the solution to the Japanese tactical system. The Japanese encirclement tactics were habitually directed against their enemies' lines of communications. They themselves, carrying many of their supplies in their packs, depending to a large degree on animal transport, and being trained to move swiftly through the jungle, were not road bound like the Indian divisions. Since the latter depended heavily on motor transport, the road block was a deadly hazard to Indian troops. Wingate proposed to form units stripped of all purely formal equipment, organized into small columns with a base of fire and a maneuvering element and supplied entirely by air. Such units in the jungle would have the mobility of ships at sea, and road blocks would hold no terror for them. Indeed, they could attack Japanese lines of communications at will. The mission of these units, Wingate suggested, would be to spread disorganization behind the Japanese lines, which could be exploited by pressure from standard infantry divisions. Obtaining Wavell's approval, Wingate organized his 77th Indian Infantry Brigade. Its members were not handpicked. Rather, the brigade was made of units then available, 2d Battalion Burma Rifles, 13th Battalion the King's Regiment, the 3/2d Gurkha Rifles, and the 142d Commando. If the Generalissimo's troops had gone into Burma in March 1943, 77th Brigade would have been used to cut the Japanese lines of communications to Myitkyina and Lashio. Thus were born the famous Chindits, as they were later nicknamed after the legendary guardian of the Burman shrines. After the Generalissimo withdrew from the March 1943 operation, the ardent Wingate asked for a chance to test his men and theories against the Japanese. Wavell agreed, and Wingate's men crossed the Chindwin in seven columns on 18 February without opposition to attack the rail line to Myitkyina in the Irrawaddy valley. Extensive damage was done to the railway, and Wingate resolved to press on across the Irrawaddy, deep into Burma. The Arakan failure plus the need to prepare for ANAKIM led to some drastic changes in Wavell's India Command. The officers charged with military training and with the immediate conduct of operations in Burma were relieved. Halting all activity and training based on the defense of India, Wavell ordered concentration of effort on offensive training. The former deputy chief of staff for operations became chief of staff of an expeditionary force headquarters, with orders to organize his staff and begin training. On 31 March General Sir George Giffard assumed command of the new expeditionary force, with orders to restore the Rangoon-Lashio line of communications by 1 May 1944. General Giffard had commanded in west Africa where he had trained two African divisions with the thought that they might be used in Burma. When Giffard came to India to arrange details of the movement, Wavell, under whom he had served in 2d Division at Aldershot in England, offered him the post of army commander. As of January-April 1943 American preparations in India for Burma's reoccupation included continued training of the Chinese Ramgarh troops, air defense of the Assam Hump terminals, air harassment of the Japanese in Burma, construction of a base at Ledo, construction of the Ledo Road into Burma, and provision of medical aid to the Chinese. Training the Chinese at Ramgarh proceeded along routine lines. The air effort will be described in Chapter IX as one of the factors leading to the decisions on U.S. policy of May 1943.
planes and subject to frequent earth tremors. The total annual rainfall through this mountain section amounts to 150 inches but it is concentrated in the monsoon season, May to September inclusive, and the observed intensity reached 14 inches in 24 hours. Construction equipment belonged to the 45th and 823d Engineers, plus additional items transferred from the Chinese lend-lease stockpile. By 20 January construction was on a 24-hour-a-day basis. "The Road head was pushed at the expense of access roads, and maintenance operations, for it was deemed advisable to make as much forward progress as possible before the monsoon rains. "119 The rate was three quarters of a mile a day of all-weather, single-track roadway with turnouts. Equipment and spare parts were in short supply, and the experience of the Christmas rains suggested that the monsoon would stop construction. On 12 March, Stilwell ordered Chinese reinforcements to the Ledo area to meet this Japanese threat.125 Meanwhile, the other Japanese expedition was moving through the Hukawng Valley and soon struck the Indian and Kachin garrison at Hkalak Ga, ten miles northwest of Shingbwiyang, screening the building of the Ledo Road. There was great excitement; the garrison and the U.S. radio team with it burnt its supplies and withdrew. General Wheeler ordered the Seagrave medical unit some miles behind at Tagap Ga, in the Patkai Hills, to pack up and be ready to evacuate. The Chinese outposts held firmly at Nathkaw south of Tagap Ga, but radio contact with them was lost at the end of March. The Headquarters, Rear Echelon, then buzzed with excitement and activity for the menace seemed progressively greater as the headquarters concerned was farther from the scene. Stilwell stepped in to pour some vinegar on the troubled waters, and the turmoil subsided when the Japanese fell back from the Tagap area and Fort Hertz, never taking Fort Hertz. Despite the Generalissimo's withdrawal from the spring 1943 campaign, Stilwell's hopes of preparing a powerful Chinese force able to play its part in breaking the blockade of China were not dashed. Working closely with T. V. Soong and General Chen Cheng, he was able to persuade the Chinese to set up training centers and begin the organizing of a second Chinese Expeditionary Force (or Y-Force as it was commonly known). Logistic preparations in India moved slowly, hampered by terrain, weather, and the paucity of available resources. The ultimate goal of this activity was the reopening of the line of communications from Rangoon to Kunming. Meanwhile, the President in Washington was inclining ever more strongly to General Chennault's views. In March, he overruled his military advisers, telling General Marshall that their views on the diplomacy and strategy of coalition war in Asia were in error, that nothing should be asked of the Generalissimo in return for American support, and that Chennault should have "his chance to do what he believes he can do." The impact of this on activities in CBI was not felt immediately, for the President's decision did not affect Hump priorities. 1. (1) The Stilwell Papers, p. 185. (2) Stilwell Diary, 18 Jan 43. 2. Ltr, Stimson to Stilwell, 6 Jan 43. Stilwell Personal Papers. 3. CM-IN 5492, Stilwell to Marshall, 12 Jan 43. This radio was relayed to Marshall, then at Casablanca. 4. Note, in Stilwell's hand. SNF-55. Stilwell's papers in this folder are for January-February 1943. It was Stilwell's custom to analyze his situation and prepare plans in advance of major discussions. It seems safe to date this note as January 1943. 5. Draft Memo, Stilwell for Soong, sub: Proposed Program In Case X-Y Opn Is Not Carried Out. SNF-55. There is no evidence that the memorandum was ever formally presented to the Chinese Foreign Minister to sign. Instead, its points were discussed with Soong, who recommended that they be laid before the Generalissimo. The Stilwell Papers, p. 184. 6. (1) Soong's request on CAF and quotation in Memo, Dorn for Stilwell, 7 Jan 43. SNF-21. (2) Draft Memo cited n. 5. 7. (1) CM-IN cited n. 3. (2) Rad WAR 2010, Marshall to Stilwell, 16 Jan. 43. Item 169, Bk 1, JWS Personal File. 8. (1) Memo with Incls, Conf, Chen, Soong, and Stilwell, 24 Jan 43. SNF-151. (2) The Stilwell Papers, p. 190. (3) Memo, Dorn for Stilwell, 15 Jan 43. Stilwell Documents, Hoover Library. 9. Stilwell B&W, 10, 11 Jan 43. 10. (1) CM-IN 7220, Stilwell to AGWAR, 16 Jan 43. The principal items on the approved requisitions were 13,500 machine guns, 3,650 trench mortars, 360 75-mm. howitzers, 360 105-mm. howitzers, 96 155-mm. howitzers, 300 40-mm. antiaircraft guns, 120 90-mm. antiaircraft guns, 20,000 submachine guns, 10,000 2½-ton trucks, 10,000 ¼-ton trucks, 35,000,000 rounds per month of 7.92-mm. ammunition, and appropriate amounts of spares for all items. (2) CM-IN 14594, Stilwell to MAB, 31 Jan 43. 11. Memo, Conf, Chen, Soong, and Stilwell, 24 Jan 43. Stilwell Documents, Hoover Library. 12. Stilwell B&W, 20 Jan 43. 13. (1) Stilwell B&W, 28 Jan 43. (2) Notes, sub: Essential Points Brought Out at Mtg of Soong, Stilwell, and Chen Cheng, Wednesday, 27 Jan 43. SNF-151. 14. Memo, Stilwell for Soong, 22 Jan 43. Stilwell Documents, Hoover Library. 15. Memo, Stilwell [Actg as CofS] for Generalissimo, 28 Jan 43. Stilwell Documents, Hoover Library. 16. (1) Memo, Stilwell for Soong, 3 Jan 43. Stilwell Documents, Hoover Library. (2) Rad CH 9, Hearn to Wheeler, 22 Jan 43. Item 182, Bk 1, JWS Personal File. 17. History of CBI, Sec. II, Ch. XIII, Staff and Administration, G-3 Section. 18. Ltr, Maj Gen Virgil L. Peterson, The Inspector General, to DCofS, 31 Dec 42. WDCSA (China), A45-466. 19. (1) Ltr, Handy to Stilwell, 31 Oct 42, sub: Transfer of ICFC to the ATC, India-China Wing. Item 348, Misc Corresp Folder (May-Dec 42), CT 23, Dr 2, KCRC. (2) Rad S 1135, Bissell to Stilwell, 24 Nov 42; Rad 1460, Stilwell to Marshall, 27 Nov 42. Items 116, 124, Bk 1, JWS Personal File. 20. (1) CM-IN 09036, Stilwell to Marshall, 20 Oct 42. (2) Rad WAR 87, Marshall to Stilwell, 21 Oct 42. WDCSA (China), A45-466. (3) CM-OUT 07429, OPD to Stilwell, 22 Oct 42. (4) MS, ICD ATC During General Stilwell's Command, Dec 42-Oct 44. History of CBI, Sec. II, Ch. VI. (5) ATC delivered 5,390 tons in September 1943 with 228 aircraft. It must be noted that the new C-46 carried 4.35 tons per flight as against 2.5 tons for the old C-47 which Stilwell had contemplated using. Of these 228 aircraft, 101 were C-46's, so Stilwell's estimate was not far off. Analysis of Transport Opns in India-China Wing, 11 Oct 42, Analysis Sec, 16th Statistical Control Unit, MATS, OSD. Statistical Serv Div, Comptroller, Andrews Field, Washington. (6) Ltr, Merrill to Stilwell, 29 Jun 43. SNF-47. 21. CCS 135, 26 Dec 42, sub: Basic Strategic Concept for 1943. 22. Ray S. Cline, Washington Command Post: The Operations Division, UNITED STATES ARMY IN WORLD WAR II (Washington, 1951), p. 334. 23. Min, CCS 59th Mtg, 17 Jan 43. 24. (1) CCS 153/1, 17 Jan 43. (2) CCS 154, 17 Jan 43. (3) Min, CCS 60th Mtg, 18 Jan 43. (4) JCS Casablanca Min, pp. 23-24. 25. (1) Min, CCS 60th Mtg, 18 Jan 43. (2) CCS 155/1, 19 Jan 43, sub: Conduct of War in 1943. (3) Min, CCS 65th Mtg, 21 Jan 43. 26. (1) CCS 170/2, 23 Jan 43, sub: Final Rpt to President and Prime Minister, Summarizing Decisions by CCS. (2) CCS 168, 22 Jan 43, sub: Conduct of War in Pacific Theater in 1943. (3) CCS 153, 17 Jan 43. 27. Winston S. Churchill, The Hinge of Fate (Boston: Houghton Mifflin Company, 1950), p. 693. 28. (1) CM-IN 1446, Stilwell to Marshall, 4 Jan 43. (2) CM-OUT 9105, Marshall to Stilwell, 27 Dec 42. 29. (1) Sherwood, Roosevelt and Hopkins, pp. 681-82. (2) Somervell became Commanding General, Army Service Forces, on 12 March 1943. 30. (1) Memo, Col Horace W. Shelmire, Arnold Mission to China, for Arnold, 6 Feb 43, sub: Logistical Situation in Kunming, China, re CATF. Gen Ref Br, OCMH. (2) Ltr, Arnold to Stilwell, 7 Feb 43. Folder 1 (GMO CKS), Item 58, OPD Exec 10. 31. Arnold quotes Stilwell to that effect in CM-IN 1641, 4 Feb 43. 32. (1) CM-IN 70, Arnold to Marshall, 1 Feb 43. (2) CM-IN 1641, Arnold to Marshall, 4 Feb 43. (3) CM-IN 2033, Wedemeyer to Marshall, 4 Feb 43. 33. COS Com, India Comd, USB/7, 1 Feb 43; Min, First American-British Conf, 1 Feb 43. History of CBI, Sec. III, Ch. VII, Arnold-Somervell-Dill Mission. 34. Henry H. Arnold, Global Mission (New York, 1949), p. 419. 35. See Ch. V, above. 36. (1) CM-IN 1449, Chiang to Roosevelt, 24 Nov 42. (2) Rad AMMISCA 1769, Roosevelt to Chiang, 2 Dec 42. Item 132, Bk 1, JWS Personal File. (3) CM-IN 12657, Chiang to Roosevelt, 28 Dec 42. (4) Rpt of Visit to Cheng-tu, CAF Hq, 1 Nov 42-1 Feb 43, by Mr. Kenneth M. Warder, Vultee Service Representative, to Stilwell, 1 Feb 43. Tate Folder (Nov 42-Jun 43), CT 40, Dr 3, KCRC. As a factory agent Mr. Warder made a routine survey of lend-lease aircraft at Cheng-tu. This report gives many examples of the way in which the Chinese misused U.S. technical equipment. (5) Memo, Chennault for Stilwell, 21 Jan 43. Folder, CAF Corresp (Mar-Jul 43), CT 23, Dr 2, KCRC. (6) Memo, Chennault for Stilwell, 22 Jan 43, sub: Employment of AAF Units at Chungking-1943. Item 9, Contracts with the Chinese (Jan-Jul 1943), CT 23, Dr 2, KCRC. See attchd Inds and Ltrs, Chou Chih-jou, Dir of Commission of Aeronautical Affairs, to Stilwell. On 19 March 1943 Chou stated that the Chinese Air Force could no longer defend Chungking and called on the United States for air support. 37. Arnold, Global Mission, p. 419. 38. CM-IN 2040, Arnold to Marshall, 5 Feb 43. 39. (1) Arnold, Global Mission, Ch. 23. (2) The Stilwell Papers, p. 196. (3) Ltr, Chiang to Roosevelt, 7 Feb 43. Folder 1 (GMO CKS), Item 58, OPD Exec 10. 40. Wavell's remark, Min, COS Com, India Comd, Chinese-British-American Conf, 9 Feb 43. Stilwell Documents, Hoover Library. 41. Min cited n. 40. 42. Ltr cited n. 39(3). 43. (1) Memo, Leahy for Marshall, 30 Dec 42. WDCSA 381 China (12-30-42), A46-523. (2) Memo, Marshall for Leahy, 4 Jan 43, sub: Chennault. Item 64, OPD Exec 10. 44. (1) Memo, Arnold for Marshall, 6 Jan 43, sub: Establishment and Asgmt of Mission to Separate Air Force in China; Memo, McNarney for Arnold, 18 Jan 43, sub: Separate Air Force in China. WDCSA 381 China, A46-523. (2) JCS Casablanca Min, p. 56. 45. Rad WAR 1955, Marshall to Stilwell, 5 Jan 43. Item 159, Bk 1, JWS Personal File. 46. Football phraseology was freely used by Stilwell in his communications. He was once quarterback of the West Point varsity and distinguished himself against a powerful team from the University of Chicago. Rad 25, Stilwell to Marshall, 8 Jan 43. Item 160, Bk 1, JWS Personal File. 47. Memo, Marshall for President, 18 Feb 43. WDCSA 381 China (2-18-43), A46-523. 48. (1) Ltr cited n. 39(3). (2) Memo, Comdr William L. Freseman for Maj Gen William R. Deane, 6 Mar 43; Ltr, Arnold to Stilwell, 7 Feb 43. Folder 1 (GMO CKS), Item 58, OPD Exec 10. (3) Rad WAR 2170, Marshall to Stilwell, 19 Feb 43; Rad SVC 395, Roosevelt to Chiang, 8 Mar 43. Items 212, 239, Bk 1, JWS Personal File. (4) Memo, Marshall for President, 22 Feb 43, sub: Chinese Theater. WDCSA (China), A45-466. 49. Ltr, President to Marshall, 8 Mar 43. Item 54, OPD Exec 10. 50. (1) Memo, Marshall for President, 16 Mar 43, sub: Your Note to Me of March 8th re China. WDCSA 381 China (3-16-43), A46-523. (2) Rad 345, Stilwell to Marshall, 15 Mar 43. Item 261, Bk 1, JWS Personal File. 51. Memo, Handy for Marshall, 18 Feb 43, sub: Proposed Award of Legion of Merit (degree of Chief Comdr) to Lt Gen Joseph W. Stilwell. OPD 201.52, WDCSA 201 (S). Marshall's stamp of approval is dated 16 March. 52. (1) Rad WAR 2373, Marshall to Stilwell, 27 Mar 43. Item 278, Bk 1, JWS Personal File. (2) Stilwell B&W, 19 Apr 43. 53. (1) Statement, Marshall to Robert E. Sherwood, 23 Jul 47. Sherwood interviewed Marshall while writing Roosevelt and Hopkins. A record of Marshall's statement is in the Hopkins Papers. (2) Interv with Marshall, 13 Jul 49. 54. Bks VII, IX, Hopkins Papers. 55. Ltr, with Inds, Chennault to Stilwell, 22 Feb 43, sub: Estimate of China Situation. Item 18, U.S. Opns, China Folder (Sep 42-Jul 43), CT 23, Dr 2, KCRC. 56. (1) Ibid. (2) Rad WAR 2120, Marshall to Stilwell, 19 Feb 43. Item 212, Bk 1, JWS Personal File. (3) GO 9, Hq USAF CBI, 11 Mar 43. Chennault was named a major general, AUS, on 3 March 1943. 57. (1) Time, February 15, 1943. (2) CM-IN 1651, Stilwell to Marshall, 4 Mar 43. (3) CM-IN 1749, Stilwell to Marshall, 4 Mar 43. (4) Ltr, Chennault to Stilwell, 2 Mar 43, sub: Article in Time magazine. Item 233, Bk 1, JWS Personal File. 58. (1) Ltr cited n. 55. (2) Rad AMMISCA 249, Stilwell to Marshall, 20 Mar 43; Rad WAR 2373, Marshall to Stilwell, 27 Mar 43. Items 268, 278, Bk 1, JWS Personal File. 59. (1) Ltr, Glenn to Stilwell, 31 Mar 43. Item 512A, Bk 2, JWS Personal File. (2) The Stilwell Papers, p. 202. (3) Rad AMMISCA 362, Stilwell to Marshall, 20 Apr 43; Rad WAR 2541, Marshall to Stilwell, 21 Apr 43. Items 512, 514, Bk 2, JWS Personal File. 60. Rad WAR 2373, Marshall to Stilwell, 27 Mar 43; Rad WAR 2047, Roosevelt to Chiang, 1 Apr 43. Items 278, 288, Bk 1, JWS Personal File. 61. Ltr, Stilwell to Wheeler, 1 Mar 43, sub: Policies and Estimates of Minimum Tonnages to be Moved Over Hump During Next Six Months. Secret Corresp Folder, Headquarters Y-FOS, KCRC. 62. (1) Chennault, Way of a Fighter, p. 217. (2) Ltr, Chennault to Wedemeyer, 6 Jul 45. WDCSA 091 China, 15 Aug 45. 63. Rad AD 537, Hearn to Stilwell, 29 Mar 43. Item 285, Bk 1, JWS Personal File. 64. Rad AG 271, Stilwell to Marshall, 31 Mar 43. Item 308, Bk 1, JWS Personal File. 65. For an account of the TRIDENT Conference, see Chapter IX, pages 327-33, below. 66. (1) Memo, Leahy for Marshall and Arnold, 24 Feb 43; Memo, Marshall for President, 27 Feb 43, sub: Reply to Generalissimo's Memo. Folder 1 (GMO CKS), Item 58, OPD Exec 10. (2) Ltr, Brig Gen John E. Hull, Actg ACofS, to Marshall, 14 Apr 43, sub: President's Message to Chiang, 31 March 1943. WDCSA (China), A45-466. 67. (1) Memo, 24 Feb 43, cited n. 66(1). (2) Memo, Marshall for Leahy, 30 Mar 43, sub: Coolie Route from India to China. Item 56, OPD Exec 10. 68. (1) Memo, Soong for President, 25 Feb 43, sub: Memo re Air Opns in China. Bk VII, Hopkins Papers. This memorandum is one of the most extreme communications from Soong, but during the spring of 1943, he was indefatigable, as the Hopkins Papers show, in carrying out his objective of getting more of everything for China. (2) Memo, Leahy for Marshall and Arnold, 1 Apr 43; Memo, Marshall for Stratemeyer, 18 Mar 43; Memo, Hull for Marshall, 14 Apr 43, sub: President's Msg to CKS, 31 Mar 43. WDCSA (China), A45-466. 69. Rad WAR 2373, Marshall to Stilwell, 27 Mar 43; Rad AMMISCA AG 271, Stilwell to Marshall, 31 Mar 43; Rad AG 536, Hearn to Stilwell, 28 Mar 43. Items 278, 308, 281. Bk 1, JWS Personal File. 70. Ltr with Incls, Soong to Hopkins, 29 Apr 43. Bk VII, Hopkins Papers. 71. In SOS in CBI, China Section, Appendix C, is a story of the first American SOS people in China. With no pocket guide or reference book to assist them in dealing with the Chinese, they "had to learn the hard way." p. 1. 72. Memo, Wheeler for Somervell, 8 May 43, sub: Restoration of Communication Facilities in Burma. Folder, Burma--Restoring Communications, Gen Ref Br, OCMH. 73. (1) MS 428, Army Service Forces Activities in the Supply of China, Burma, and India, 1942-1943, pp. 50-54. Gen Ref Br, OCMH. (2) Rpt, Col Frederick S. Strong, Jr., Chief Engr, SOS CBI, to Somervell, 13 Nov 43. Somervell File, Vol IV, Hq ASF, Theaters of Opns, CBI 1944, A46-257. (Hereafter, Somervell File, --) (3) Min, CCS 73d Mtg, 26 Feb 43. 74. (1) CM-IN 430, Stilwell to Marshall, 1 Apr 43. (2) Memo, Marshall for Dill, 8 Apr 43, sub: Program for India-China Wing. Item 66, OPD Exec 10. (3) Ltr, Alexander to Arnold, 19 Apr 43, with Incl, Rad NR J1339, Bissell to Alexander, 30 Jan 43. Folder, New Airdromes in India Corresp (Dec 42-May 43), CT 23, Dr 2, KCRC. (4) CM-IN 11827, Stilwell to Marshall, 27 Mar 43. (5) Ltr, Col Robert F. Tate, Air Off, Hq USAF CBI, to Stilwell, 12 Feb 43, sub: Airdrome Housing and Operational Facilities. Folder, New Airdromes in India Corresp (Dec 42-May 43), CT 23, Dr 2, KCRC. 75. Stilwell B&W, 19 Apr 43. 76. The Stilwell Papers, p. 202. 77. Notes, Lt Col Henry A. Byroade, Engr, sub: Notes for Record on Airdrome Construction and Cargo Availability for India-China Freight Line, 23 Jun 43. Somervell File, Vol III, CBI 42-43. 78. Memo with Incls, Chennault for Arnold, 4 May 43, sub: Factors Which Limit Opns of 14th Air Force. OPD 381 CTO, III, A47-30. 79. (1) Rpt, Hq Y-FOS USAF CBI, 10 Jul 44, sub: Hist Rpt for 1943. History of CBI, Sec. II, Ch. III, pp. 4-5. (2) The Stilwell Papers, p. 198. 80. Notes, Training for Y-Force, with Incl, Chinese text. SNF-151. 81. (1) Stipulations Concerning the Employment of the American Instructors. SNF-55. Couched in legal terms, the paper appears to be based on contracts for hired instructors. (2) Draft Memo in Stilwell's hand, for Shang Chen, NMC. SNF-55. 82. (1) The Stilwell Papers, p. 190. (2) CM-IN 8392, MA Chungking to MILID, 17 Feb 43. (3) Rad C-8, Dorn to Stilwell, 9 Feb 43. Item 207, Bk 1, JWS Personal File. (4) CM-IN 3365, Stilwell to Marshall, 6 Apr 43. 85. Waters Report, p. 28, quotation on p. 14. 86. Waters Report, pp. 18, 69. 87. Waters Report, pp. 53-54, 66. 88. (1) Waters Report, p. 10. (2) Quotation from History of CBI, p. 138. 89. Waters Report, pp. 22, 30, 73-78. 90. Directive, Stilwell to Arms, 12 Mar 43. AG (Y-FOS) 353, KCRC. 91. (1) Jour, 1943, Hq Infantry Training Center. Gen Ref Br, OCMH. (2) Progress Rpt 1, 25 Mar-22 Apr 43, Arms to Stilwell, dated 22 Apr 43. AG (Y-FOS) 354.6, KCRC. 93. (1) Rpt cited n. 91(2). (2) History of CBI, p. 138. 94. Wood, Copy of Rpts, Tali Mil District, Yoke Force, CBI Opns 43-44, p. 4. Gen Ref Br, OCMH. 95. Memo cited n. 15. 96. CM-IN 4217, Stilwell to Marshall, 9 Mar 43. 98. (1) CM-IN 16435, Stilwell to Soong, 30 Mar 43. (2) CM-IN 10597, Stilwell to Soong, 20 Mar 43. (3) Cases 122, 126, 127, OPD 381 CTO, A47-30. 99. Memo, Wang Wen-hsien, Admin Dept, NMC, for Dorn, 23 Mar 43, sub: Personnel Reqmts for Y-Force. AG (Y-FOS) 320.2, KCRC. 100. Waters Report, pp. 65-66. 101. The General Plan of ANAKIM (Y-Force Project), 19 May 1943, is a staff study of the Y-Force role in projected Burma operations during the 1943-1944 dry season. It also contains the general scheme for re-equipping the Y-Force divisions from Chinese and U.S. contributions. Gen Ref Br, OCMH. 102. Stilwell Diary, 18 Apr 43. 103. Japanese Study 77, pp. 95-97. 104. (1) Ibid. (2) MA (China) Rpt 417, Tai-Heng Fighting, 16 Apr-28 May 43. MID Library. (3) Headquarters, USAF, CBI, was not officially informed of the seriousness of the I-chang fighting until 11 May 1943. CM-IN 12914, Hearn to Stilwell, 20 May 43. 105. See Ch. VII, p. 250, above. 106. (1) Owen, Campaign in Burma, pp. 31-38. (2) Wavell Despatch, January 1 to June 20, 1943, Supplement to The London Gazette. (3) Japanese Study 89, pp. 5-8. 107. (1) Wavell Despatch, January 1 to June 20, 1943, Supplement to The London Gazette. (2) Wingate's Rpt. Library, Hq Infantry School, Ft. Benning, Ga.
108. (1) Wavell Despatch, January 1 to June 20, 1943, Supplement to The London Gazette, pars. 24-28. (2) SEATIC Bull 240, 9 Jul 46, pp. 3-5. MID Library. (3) Japanese Study 89, p. 12. 109. (1) Ltr, Col Osmun to Brig Gen Hayes A. Kroner, Chief of Mil Int Serv, 17 Apr 43. ABC 337 TRIDENT (May 43) Sec E, A48-224. (2) CM-IN 2540, Ferris to Marshall, 4 Apr 43. (3) CM-IN 5915, Stilwell to Marshall, 10 Apr 43. (4) CM-IN 11837, Stilwell to Marshall, 23 Mar 43. (5) The Memoirs of Cordell Hull, Vol. II, p. 1494. 110. (1) Rad AMMDEL 305, Stilwell to Marshall, 10 Apr 43. Item 316, Bk 1, JWS Personal File. 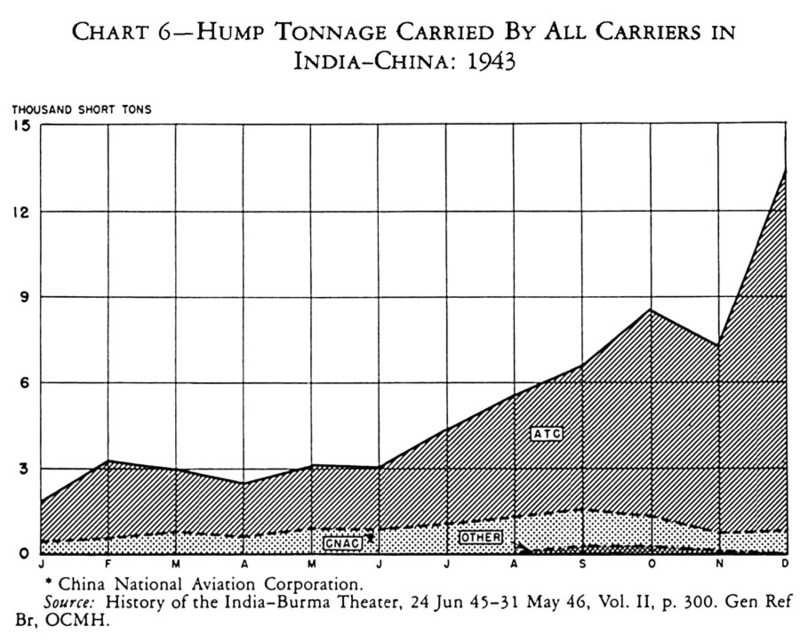 (2) Memo, Maj Gen LeRoy Lutes, Dir of Opns, ASF, for Somervell, 19 May 43, sub: Monthly U.S. and UK tonnage for Projected Opns in India; Memo, Chief, Strategy Sec, OPD, for Wedemeyer, 17 May 43, sub: Estimate of Tonnage Required for ANAKIM Opn; Memo, Brig Gen Patrick H. Tansey, Chief, Logistics Gp, OPD, for Wedemeyer, 17 May 43, sub: British Reqmts for India. ABC 337 TRIDENT (May 43) Sec E, A48-224. 111. Memo, Somervell for Marshall, 14 May 43, sub: Memo on Monthy Tonnage of Shipping Space Required from North Africa and UK for ANAKIM; Memo, Somervell for Wedemeyer, 23 May 43, sub: Memo on Shipts Required for Opns in India. ABC 337 TRIDENT (May 43) Sec E, A48-224. 112. In Stilwell Undated Paper 21, Stilwell continued this note by saying that the United States and China were to do things "50-50," but that "equip., instr, and $$ and backing equalled 0 plus obstruction," that of 324 divisions, 60-odd brigades, and 89 guerrilla units on the Chinese Order of Battle, the Generalissimo had been able to spare three for Stilwell. The paper probably belongs to the fall of 1943, because of its reference to the 3,000 U.S. combat troops, undoubtedly the GALAHAD Project, or Merrill's Marauders. Stilwell Documents, Hoover Library. 113. (1) Incl to Memo, Leahy for JCS, 7 Apr 43. Item 63, OPD Exec 10. (2) Memo, Lt Gen G. N. Macready, JSM, for Marshall, 13 Apr 43. Item 60, OPD Exec 10. (3) Ltr, Macready to Marshall, 20 Apr 43. Case 131, OPD 381 CTO, A47-30. (4) Rad AG 305, Stilwell to Marshall, 10 Apr 43. Item 316, Bk 1, JWS Personal File. (5) Morison, Rising Sun in the Pacific, p. 344. 114. SOS in CBI, App. 6, Advance Section No. 3. 115. (1) History of CBI, Sec. II, Ch. II, The Ledo Road, pp. 1-9. (2) Rpt, Maj Gen Lewis A. Pick, CG, Hq Advance Sec, U.S. Forces, India-Burma Theater, 9 Aug 45, quotation on pp. 5-6. Gen Ref Br, OCMH. 116. Rad TORCH A679, Wheeler to Stilwell, 9 Jan 43. Item 163, Bk 1, JWS Personal File. 117. (1) Ltr, Engr-in-Chief, sub: Notes on Ledo Road Project. SNF-84. (2) Ltr, Gen Holcombe, Actg CG, SOS USAF CBI, to Somervell, 19 Feb 43. Somervell File, Vol III, CBI 42-43. 118. History of CBI, Sec. II, Ch. II, The Ledo Road, p. 11. 120. (1) History of CBI, Sec. II, Ch. II, The Ledo Road, p. 13. (2) Rads RA-68 and T-92, Stilwell to Wheeler and Boatner. Item 186, Bk 1, JWS Personal File. 121. History of CBI, Sec. II, Ch. II, The Ledo Road, pp. 13-14. 122. (1) Col Tamraz, Diary entry of 21 Feb 43. Office, Surgeon Gen, Hist Sec. (2) Memo, Handy for Marshall, 15 Aug 43, sub: Digest of Cables Reed from Stilwell re Burma Opns. Item 51, OPD Exec 10. (3) TB Med 77. Office, Surgeon Gen, Hist Sec. 123. (1) SOS in CBI, App. 16, Medical Section, pp. 7, 20-21. (2) Memo cited n. 122(2). 124. SEATIC Bull 247, 22 Apr 47, p. 2; Incl (B) to Naval Ln Off, Rangoon, Conf Rpt 49-46, 16 May 46. MID Library. 125. Rad AGWAR 233, Stilwell to Marshall, 12 Mar 43. Item 251, Bk 1, JWS Personal File. 126. (1) Gordon S. Seagrave, M.D., Burma Surgeon Returns (New York, 1946), p. 31. (2) G-2 Rpts, Forward Echelon, Chih Hui Pu, 1, 6, 9, 13, 22 Mar and 20 Apr 43; Sitrep, 2 May 43. Northern Combat Area Command Files, KCRC. (3) Bull and Incl cited n. 124. 127. Rad AMMDEL 151, Ferris to Stilwell, 1 Mar 43. Item 225, Bk 1, JWS Personal File.